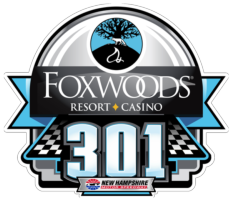 The Monster Energy NASCAR Cup Series will take center stage for the Foxwoods Resort Casino 301 on Sunday, July 21 at 3:00 p.m. with qualifying on Friday, July 19 at 4:45 p.m. In 2018, Kevin Harvick hit the jackpot, taking his sixth 2018 win in the Monster Energy NASCAR Cup Series Foxwoods Resort Casino 301 at New Hampshire Motor Speedway after an intense battle with Kyle Busch for the lead in the final laps to cross the finish line first. Harvick had already conquered the one-mile zipline at Foxwoods Resort Casino in May to announce the multi-year partnership between the speedway and Foxwoods Resort Casino, and now, the majestic Rainmaker trophy is his, along with 19-pound Loudon the Lobster, after he conquered “The Magic Mile” for his third Monster Energy NASCAR Cup Series win at NHMS. With seven laps to go, Harvick got to the back bumper and pushed Kyle Busch out of the way. Harvick was all over Busch, tapping him multiple times, sending him out of the racing groove into Turn 2 to take the lead for good. Busch didn’t feel like he had the best car in the race, even though he certainly knows how to get to Victory Lane at NHMS. The 2015 NASCAR champion is the all-time leader in NASCAR national series wins at NHMS including a trip to Victory Lane in last September’s race. Harvick qualified 14th, made up seven spots by the end of Stage 1 and was up to fourth by the end of Stage 2. He led three times for a total of 12 laps, including the most important lap – the final one that earned him a spot in Victory Lane. The NASCAR Xfinity Series will race in the Lakes Region 200 on Saturday, July 20 at 4:00 p.m. with qualifying on the same day at 11:05 a.m.
Last year, Christopher Bell’s first NASCAR Xfinity Series appearance at New Hampshire Motor Speedway ended with a win, giving him his second consecutive NASCAR Xfinity Series victory after the previous week’s trip to Victory Lane in Kentucky. The NASCAR Whelen Modified Tour Eastern Propane & Oil 100 is on Saturday, July 20 at 2:00 p.m. with qualifying on the same day at 9:00 a.m.
Last year, the Eastern Propane & Oil 100 turned into a quarter-mile drag race between Bobby Santos III and Chase Dowling as the pair headed for the granite stripe on the final lap of the race. Santos edged out Dowling by .014 seconds for his fourth NASCAR Whelen Modified Tour victory at New Hampshire Motor Speedway. Santos made up seven spots over the final 21 laps to earn the victory. He made up two spots on lap 80 as he moved into fifth from seventh. Following the red flag on lap 86, Santos moved up to fourth and started fighting for the lead. Over the final four laps, he challenged Dowling, Justin Bonsignore and Ryan Newman as the four drivers exchanged the lead more than half a dozen times, setting up the intense final lap dash for the checkered flag. "We were just running our race,” said Santos. “They are hundred lap races, so the guys gave me a great race car and put us in position when it mattered. This is really cool. I've got great people behind me. I'm very happy." Dowling, Newman and Bonsignore, who finished second, third and fourth respectively, couldn’t hold off Santos as the trio ran in the top three for the majority of the race. The NASCAR K&N Pro Series East United Site Services 70 takes on “The Magic Mile” on Saturday, July 20 at approximately 6:45 p.m. with qualifying on Friday, July 19 at 7:05 p.m.
Last year, Tyler Ankrum dominated the NASCAR K&N Pro Series East United Site Services 70 at New Hampshire Motor Speedway for his third win of the season. Ankrum started on the outside pole, took the lead on the opening lap and never looked back. "I'm not really too sure, honestly," said Ankrum when asked about what went into his dominating performance. "I guess it just kind of happened. The guys gave me a really fast race car." NASCAR rising star Harrison Burton tried to chase down Ankrum throughout the race. Burton used lapped traffic to pull within a second of the leader with less than a dozen laps to go, but could get no closer. Once Ankrum got through the traffic, he pulled away and earned the win by a margin of 2.387 seconds over the son of former NASCAR driver and current NBC analyst Jeff Burton. Anthony Alfredo raced to a third place finish while Tyler Dippel finished fourth. Pole sitter Derek Kraus fell back early but ended the evening with a solid fifth place finish. The NASCAR Whelen Modified Tour All Star Shootout gets the on-track action started on Friday, July 19 at 2:10 p.m. It’s a timed 30-minute event. Last year, he may have come into the race trying to preserve his race car for Saturday’s 100-lap main event, but Justin Bonsignore left no doubt how badly he wanted to win the 2018 NASCAR Whelen Modified Tour All Star Shootout at New Hampshire Motor Speedway. The driver of the No. 51 Phoenix Communications dove to the bottom of turn four on the final lap to make sure challenger Doug Coby couldn’t steal the victory. Bonsignore narrowly edged the No. 2 car of Doug Coby, who spent the second half of the race trying to find a line that would take him past the race leader. Coby and Rowan Pennink battled fiercely for second place before the two cars bumped in the final lap, sending Pennink’s No. 3 car into the outside wall. Eric Goodale took third place, Jon McKennedy finished fourth, Bobby Santos was fifth, followed by Ryan Preece, Andy Seiss, Ryan Newman, Woody Pitkat and Matt Swanson rounding out the top-10 finishers. The All Star Shootout featured a 35-lap run in a 30-minute timeframe, with a mandatory pit stop at lap 20. The top-five leaders were inverted before the second half restart. Bonsignore started the race 12th and had to weave his way through the field to win the race. There were three cautions thrown during the race. The winner admitted he was trying to preserve and protect his race car during Friday’s race, but felt the entire field of drivers seemed aggressive from the opening lap. This is the second straight Whelen Modified event victory for Bonsignore this month and his second win at New Hampshire Motor Speedway. Bonsignore won the F.W. Webb 100 on September 24, 2016.